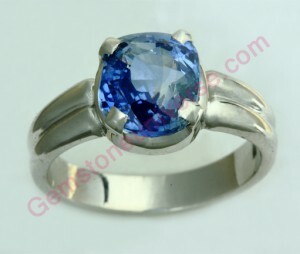 Comments A beautiful natural Sri Lankan Blue Sapphire, which we classify as an Ah-Ha Gemstone. Unmatched colour, fully natural, perfectly proportioned and a treat to the eyes. The work of the almighty is magical and this can be seen in this nearly eye clean untreated Sri Lankan Blue Sapphire. This gemstone has the potency to harness the best of Sattvik Saturn energies. Looks even more brilliant when set in this 4 pronged elegant sterling silver ring!